Ai WeiWei's Zodiac Head Tumblr is a platform designed to highlight Zodiac Heads', the historic outdoor public sculpture exhibition by acclaimed Chinese artist Ai WeiWei. Internationally acclaimed Chinese contemporary artist Ai Weiwei has reinterpreted the twelve bronze animal heads representing the traditional Chinese zodiac that once adorned the famed fountain-clock of the Yuanming Yuan, an imperial retreat in Beijing. 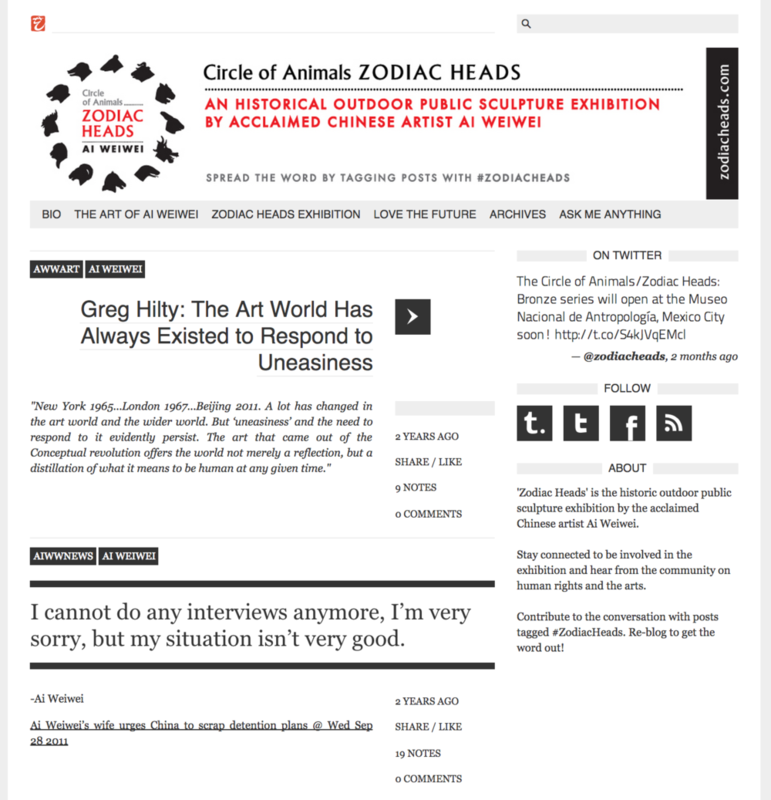 The Tumblr features such content as Ai WeiWei's artistic methods, the Zodiac Heads exhibition as it travels throughout the world, and active conversations between the artist and his following. The Tumblr acted as a connection to the global exhibition and a hub for the community on human rights and the arts. Ai WeiWei's Zodiac Heads Tumblr was designed to highlight Zodiac Heads, the historic outdoor public sculpture exhibition by acclaimed Chinese artist and activist Ai WeiWei. The internationally acclaimed contemporary artist had reinterpreted the twelve bronze animal heads representing the traditional Chinese zodiac that once adorned the famed fountain-clock of the Yuanming Yuan, an imperial retreat in Beijing. The exhibit was revealed in New York City in front of The Plaza Hotel, just as the artist was being placed under house arrest in Beijing for speaking out against the Chinese government. 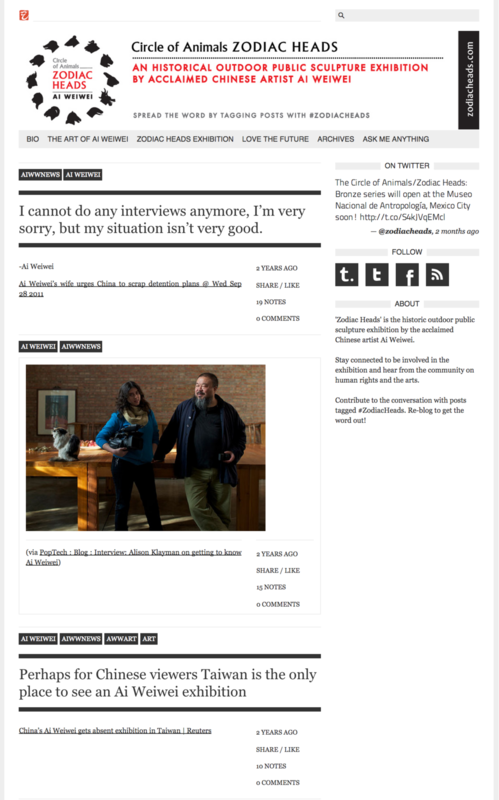 The Tumblr aggregates content on such topics as Ai WeiWei's artistic methods, his political activities, the Zodiac Heads exhibition as it travels throughout the world, reviews of the exhibit, and active conversations between the artist and his following. It acted as a connection to the global exhibition and a hub for the community on human rights and the arts.